Ballito Manor 405 - Ballito Central Accommodation. 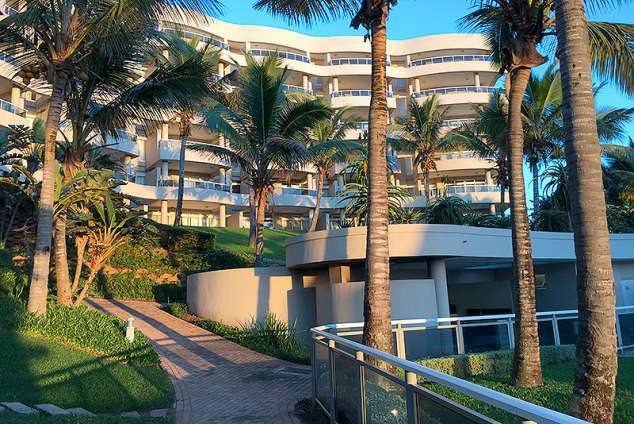 Nestled in a quiet cul-de-sac of Ballito on the Dolphin Coast, this magnificent upmarket apartment on the beach front, is designed to meet all your expectations. Breath-taking views, songs of the ocean waves and luxurious furnishes and fittings welcome you. Italian designer furniture, travertine marble tiles, stainless steel fittings and most up to date electronic equipment ensures your stay is a luxurious one. Entertainment areas allow for you and your guest to enjoy or just a romantic seating of two, with open plan entertainment allow interior entertainment or outside on the patio with the breathtaking views, the choice is yours! Reception areas await your guests, enter with lifts to the fourth floor where the apartment is on one level with easy access to pool and beach areas. the complex is right on the beach. Entrance hall, open-plan kitchen, lounge and dining room, guest loo, 2 bedrooms on suite with shower and bath, main bedroom has a queen bed, second bedroom has 2 single beds, thus sleeping 4 adults or 2 adults and 2 children, bidet (main bathroom only), double underground parking, full 24 hours security guards with CCTV throughout. Large patio. Main bedroom leads to patio as well as lounge and both have direct sea views. 32" LCD TV, DStv, built in cupboards with coat hangers, safe in main bedroom, Miele washing machine, tumble dryer, microwave, Bosch filter coffee maker, 300% percale white cotton sheets and 550gms Glodina white towels. Baby sitting can be arranged by agencies in Ballito yourself. The pool is fenced. There are built in barbeques at pool. There is wheel chair access and they can get around and even to beach on wheelchair. We are on the fourth floor. Bring your own beach umbrella as we supply 4 beach towels. Serviced daily except on Sundays and public holidays due to transport issues for staff. DSTV decoder and card with premium bouquet. Shakaland (40km). Harold Johnson Nature Reserves (30km). Mt Edgecombe & Prince's Grant Golf Estate (15km). uShaka Marine World (15km). Dolphin Watching & the Sardine Run (2km). Zimbali Golf Estate (1km). The Hluhluwe-Umfolozi Game Park (257km). Crocodile Creek (15km). Skydiving & microlight flights (10km). Scuba diving and snorkelling (10km). Paddle skiing, exercising on the promenade, diving, surfing, fishing, microlighting, dolphin viewing, wale watching and safe warm-water swimming. Large pool for training or relaxation, with luxury pool house. Parking for guests and 2 undercover garages onsite. Braai'ing facilities around the pool. Kitchen Fully Equipped: tumble dryer, washing machine, microwave, fridge, freezer and all the cutlery and crockery needed. Lock-up safe in bedroom. Parking for guests and 2 lock up garages onsite. Next-generation 24 hour security. Internationally rated golf courses, such as Zimbali, Princess Grant and others (less than 5km away). Horse riding (less than 5km). Sibiya Casino (less than 5km). 20 minutes away from Gateway, Umhlanga Ridge New Town Centre. Loads of restaurants, bars and night clubs to choose from in the Ballito area. Medical facilities (less than 5km). Follow the N2 signs from the Durban International Airport in the direction of Stanger and continue on the N2 highway all the way, pass Umhlanga and Gateway center and the toll gates and once you see the sign COMPENSATION ROAD, BALLITO, take this offramp and then at T-junction from highway and turn right and travel past the LIFESTYLE center and cross over two traffic circles and then continue straight all the way down towards the beach until you reach Compensation Beach Road and then turn right into this road and complex is at end on right hand side. Keys Collection to be collected at Cyberview's Offices at Ballito Boulevard. Detail description : Its absolutely breathtaking to wake up every morning with the ocean looking right at you! 94348 page views since 25 Sep, 2007. Last updated on 06 Nov, 2018.